It was a long way to go on the off-chance of an interview with Roman Abramovich, the new owner of Chelsea FC: 4,000 miles, nine hours crammed into an Ilyushin jet. There was no leg room, and no guarantee that we'd be let out the other end. Chukotka is part of Russia, but you need a special permit to travel there, and we didn't have one. I couldn't get to sleep. I kept having visions of being dragged off the plane by stern-faced Cold War-era border guards, cast into the tundra and left to the mercy of wild reindeer. By the time we landed at Anadyr airport, I was so exhausted, that in my rather confused state of mind those border guards had metamorphosed into Chukotkan reindeer in Red Army uniforms, waiting to pierce me with their antlers. The plane door swung open and in marched two incredibly cheerful female border guards. They were full of smiles and chuckling away to themselves as they checked everyone's papers. Soon it was our turn. "BBC," I said rather nervously as I handed over our passports. "Ah, BBC!" she replied with another cheerful little chuckle. "Follow me." We obeyed. To my relief, instead of being looked on as villains, we were treated as VIPs. A delegation from the local administration greeted us and took us into town. We'd cleared the first hurdle. we were inside Chukotka. The following day, Roman Abramovich flew in on his private jet. Mr Abramovich's adviser Alexander contacted us at the hotel. The news wasn't good. The Governor wouldn't be giving any television interviews, he said. Mr Abramovich had never given any before, and he wasn't planning to start now. I was devastated. We had come all this way, nine time zones from Moscow, to what seemed like the end of the earth, just to hear the word "Nyet!" We agreed to meet up with Alexander at the local beer restaurant and billiards hall. I'm glad we did. During dinner, Alexander caught sight of a familiar face. "Fancy meeting the Governor?" he asked. We were ushered to a table in a quiet corner, and there he was, Roman Abramovich. He didn't look anything like I'd imagined Russia's second-richest man to look. He wore jeans, a white sweater, he had designer stubble. And there he sat, sipping a glass of water. This was the perfect opportunity to break the ice. We chatted about football. It was a dangerous confession to make, but I admitted I wasn't a Chelsea fan - I supported Spurs. "Ah, Tottenham," he said, excitedly. "I nearly bought that." He told us we could travel with him on his helicopter around Chukotka. He was willing to be filmed, but there would be no interview. So we did film him, on a visit to a whale hunters' village, at a concert of Chukotkan throat singing, and as Mr Abramovich inspected dozens of construction projects which he's personally funding. Next morning, the phone rang. It was Alexander. "The Governor's on his way to your hotel," he said. "Be downstairs in 10 minutes." 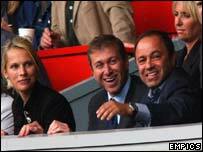 When Mr Abramovich arrived, he invited us to spend another day with him on his helicopter. And this time, he said, he might be prepared to give an interview. So off we flew again, to see reindeers and oil platforms, chukchi wigwams and village schools. Then back to base in Anadyr. Before I could pin him down about the interview, though, Mr Abramovich slipped into his car and drove away. That, I feared, was the last I'd ever see of Chelsea's new owner. But I was wrong. One hour later we were summoned to the Governor's office. Roman Abramovich was ready and willing to give his first ever television interview. Afterwards, we stayed up all night editing a piece for the Ten O'clock News, and fed it to London. Bleary eyed, I sank into a chair and was just nodding off when there was a knock on the door. It was John, our cameraman - and he sounded worried. "He wants to see the report." "Who does?" I replied, half asleep. "Abramovich. And he wants to see it now." We took our edit machine to the Governor's office and played him the tape. He sat glued to the screen, fascinated to see himself on TV. What did he think of it, we asked? "Well, it's not too disgusting," he replied. I think that was a compliment. Interview over, we could all relax. And what better way to do so than with a few frames of Russian billiards. 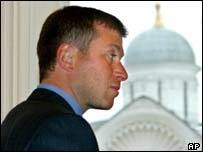 "Abramovich versus Rosenberg," more exciting than any premiership tussle. The pride of the BBC was at stake. Unfortunately, I got a little confused with the rules and, quite unintentionally, began putting balls that my opponent had potted back on the table. This left Mr Abramovich scratching his head. It's not everyday you get play billiards with one of the world' s richest men, and then cheat. Thank goodness we'd recorded the interview first.